The guns fell silent on the Somme Offensive in November 1918 and 100 years on the legacy of this pointless slaughter remains for everyone to see. 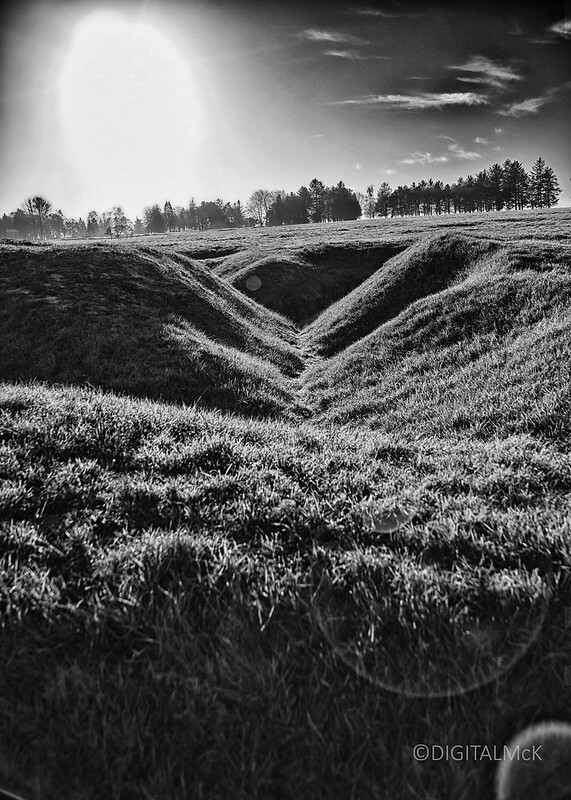 My photographic trip to the battlefield, yielded a number of powerful photographs from an experience that I can only really describe as disquieting. The idea, as described in my last post was to see a particular grave of a friend’s ancestor, but after visiting the grave, we decided to explore the battle field and travelled to the preserved trench lines of Beaumont-Hamel, which forms part of the monument to the soldiers of the Newfoundland Regiment that fought there. You can find more about the monument by clicking here. At the monument you can walk through the Allied trench line to the German trench line and really get a true feeling of the closeness of the trenches and the utter madness of the way battles were fought in the Great War. This photo shows so called Wellington Trench, which marked the absolute front line of the British and Imperial armies at one point in the Battle of the Somme. It is below a ridge and only 5 or 6 minutes walk from the corresponding trench of the Imperial German forces. It is an uphill walk to the German trench and would have been slaughter to attack. The Newfoundlanders attacked as ordered and more than 2/3rds of them were killed or wounded. It is a peaceful place, which is not at peace with itself. I have visited the Verdun battlefield and like the Verdun site, you have the sense that every inch of the ground is blood soaked. Walking around the site there is the sense that the land is not at peace, this sense was reinforced by the sound of the crows cawing in the trees.